Half lifestyle guide and half cookbook, Going Vegan by Joni Marie Newman and Gerrie Lynn Adams is a great resource for the veg-curious, those who are new to veganism or vegans who are fans of easy, no-fuss vegan cooking. What makes GV different from other vegan primers is that it’s written from two viewpoints: one from Joni—an ethical vegan motivated by compassion for all animals and Gerri—a health-driven vegan motivated by the benefits of a plant-based diet. One of the most common assumptions about a vegan/plant-based diet is that the food simply won’t taste good. One look at Celine Steen‘s gorgeous photography throughout the cookbook portion of the book will show that assumption is false, while Joni and Gerrie gently but expertly debunk the myth that vegan food is expensive and complicated to find and make. Wondering how to stock a vegan kitchen? Going Vegan will show you how. Confused about soy and how much protein you actually need? Going Vegan breaks it all down. One you have digested that information, it’s on to the food, which is all approachable, simple, healthy and easy to make. I first tried GV’s Tahini Noodle Bowl because I was intrigued by the sauce that paired balsamic vinegar and tahini—two things I’ve never thought of using together. This combination created an incredibly luscious and delicious sauce to drench over noodles that was good both hot and cold as leftovers the next day. This is a great “go to” dish we’ll be making for quick weeknight dinners and lunches for its simplicity, versatility and ease. If you want to try this recipe out too, your’e in luck: the kind folks over at Fair Winds Press have allowed me to share it here, and are offering to giveaway one free copy of the book through this post! To enter for a chance to win, just leave in the comments section your reason for “Going Vegan” or your favorite “go to” vegan dish. Be sure to leave your email, instagram or twitter handle or some other way to contact you in case your comment is chosen. The winner of this giveaway is Erin G. Thanks to all who entered! I’ll randomly choose a winner on February 10 … good luck! Shipping is limited to US/Canada only. From Going Vegan: The Complete Guide to Making a Healthy Transition to a Plant-Based Lifestyle. Published by and posted here with permission from Fair Winds Press. Seems like bowls are all the rage in the vegan community right now. You can make noodle bowls so many ways and serve them hot or cold. We thought this would be a fun one to share, because it shows how easy a restaurant-style dish can be made at home, plus it gives you an idea on how to create your own bowl dishes anytime. Prepare the pasta, according to the package directions. To make the sauce: Meanwhile, in a small bowl, place the sauce ingredients. Whisk the ingredients until smooth. Transfer to squeeze bottle, and set aside until ready to use. 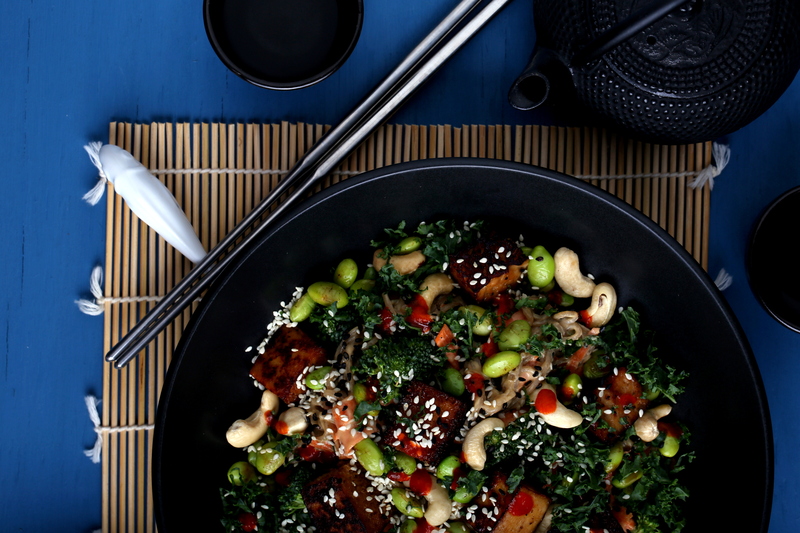 To make the bowl: Add oil to a wok or frying pan and heat over medium high. Add tofu, carrots, broccoli, peas, edamame, cashews, and red chili flakes. Toss to combine. Season to taste with salt and pepper. 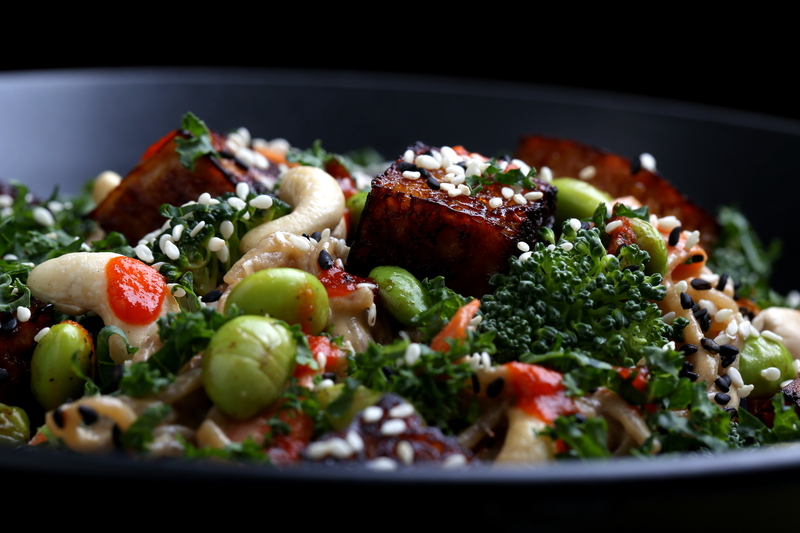 Saute 6 to 8 minutes, or until veggies are bright and vibrant and tofu is slightly browned. To assemble the bowls, start with four pasta-sized bowl. Add 1/4 of the arugula to the bottom of the bowl. Top with 1/4 of the spaghetti. Next add 1/4 of the stir-fried mixture. Top with desired amount of sauce and sprinkle with sesame seeds to finish. These bowls can be served hot or cold, which makes them ideal make-ahead meals and easy to pack for lunches throughout the week. Simply leave off the sauce until ready to enjoy! such as quinoa, brown rice, or bulgur. I definitely went vegan for ethical reasons, but it's worked out beautifully since it's made definite improvements to my health! 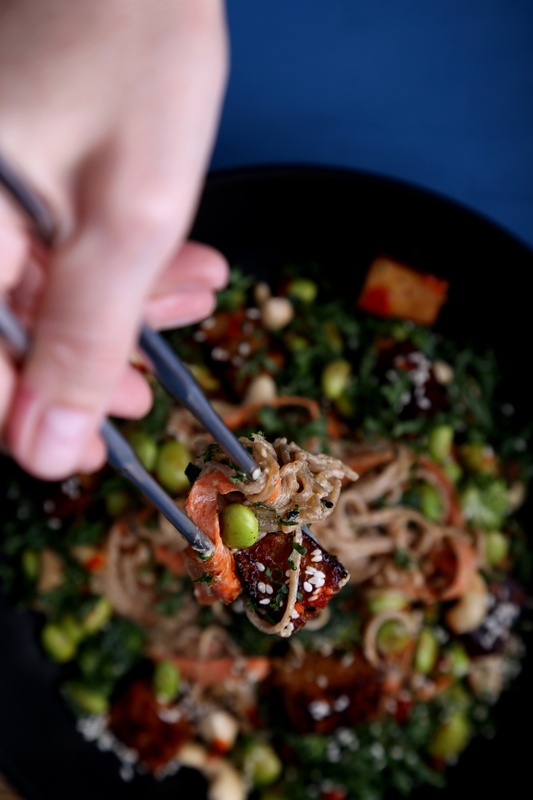 My go-to recipe is actually a noodle and veggie bowl but with a peanut butter-based sauce, so this recipe sounds like an awesome way to mix things up! I decided to begin eating mostly vegan for ethical reasons. One of my family's favorite meals is homemade tortillas with lots of fixings – black beans, salsa, caramelized onions, guacamole, cilantro, lime, roasted peppers, etc. We went vegan for ethical and environmental concerns. In winter, my favorite go to dishes are hearty bean studded soups served with a complementary bread. I went vegan, over 30 years ago, for the animals. I went vegan 22 years ago for ethical reasons. Environmental and health reasons are also great reasons to be vegan. I went vegan because of the mistreatment of animals …and it helps that it's much healthier and way more fun/creative to cook! My favorite go-to dish is Isa's chipolte mac and "cheese" and any roasted vegetable I have available. My reason for going vegan is because of the mistreatment and abuse of animals. And I'm staying vegan because who needs meat, dairy and eggs with so many delicious recipes? I became vegan because I was very overweight and all of my vegan friends were so healthy and fit. I stayed vegan because not only did i feel better physically, I felt I was making better ethical decisions. It has since been 5 years and veganism has impacted every facet of my life in a positive way. Because for me, living deliberately and authentically means not harming animals, and certainly not eating them. As soon as I started a more compassionate lifestyle, it was as if a great weight had been lifted that I never even knew was there.